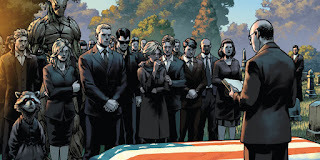 Two Feet Below: Stan Lee-Need I Say More? Joining disabled and able-bodied to make a difference. Stan Lee-Need I Say More? So, I gave myself a day to digest the fact that Stan Lee’s died. Comics as we know them is no more. That sounds dramatic, I know, but think about it. The man was 95, he started started in the comic business as a grunt at 17 filling inkwells among other stuff according to Ain’t It Cool News, and two years later, Lee was doing comics. With DC Comics leading the pack in the 50s, the owner of Timely, Atlas and Marvel Comics tasked Lee with coming up with a rival superhero team…Fantastic Four was born. Not to sound cliché, but the rest is history. Of course, the man was so much more than his comics. Again, according to Ain’t It Cool News, he was a vet, having served in the army in WWII as well as being a husband, father, and grandfather. He was a role model to millions to know what could be. According to MovieWeb, he’d finished shooting his cameo for Avengers 4, a treat fans looked forward to ever since the MCU’d been brought to film, so we’ll get to see him one last time come May. Our condolences to Mr. Lee’s family, friends, and fans. Be good to each other. The online portfolio of Ann-Michelle Molinar. The online portfolio of Fabian Molinar. A life-long advocate of people with disabilities, Cindy Kolbe shares her daughter's challenges with a new spinal cord injury after an accident, as well as her own experiences as a mother trying to help her family heal. Let me introduce Nick Moreau, an up and coming lawyer. He has everything he could possibly want: money, rising power, a loving wife. He's living the American Dream. He's cut throat, balls to the wall in nature coupled with chiseled good looks...curly brown hair, deep, dark eyes, strong jaw line. Two Feet Below. Ethereal theme. Powered by Blogger.